This coming sunday 6th of December 2009 will enter the annals of history as far as the Rastafari faith is concerned. A man of the Rastafari faith will be crowned king in Malawi. This will be the first Ras ever known to become a king in Malawi and probably the first one across the whole world unless proven otherwise. Of particular interest is the fact that a distant grand father of this Ras by the name of King Mponda was one of the three kings representing the nations of Malawi who crowned His Imperial Majesty Emperor Haile Selassie on 3rd August 1965 as 'GREAT KING OF MALAWI.' 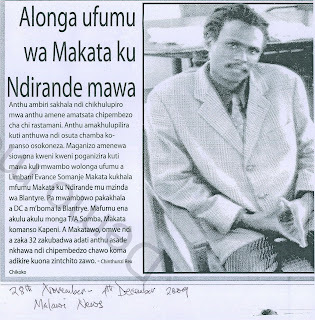 This was during HIM's historic visit to Malawi. Rases acrosss the world are hereby encouraged to send congratulatory messages to this king. SmS texts would do. The number of this Ras is:+265 999 289 094 and his name is Ras Limbani. I phoned him this morning and he told me that the ceremony was initially scheduled to take place yesterday the29th December 2009. But it had to be shifted to next sunday inorder to accomodate a member of parliament in the area where the coronation is to take place. 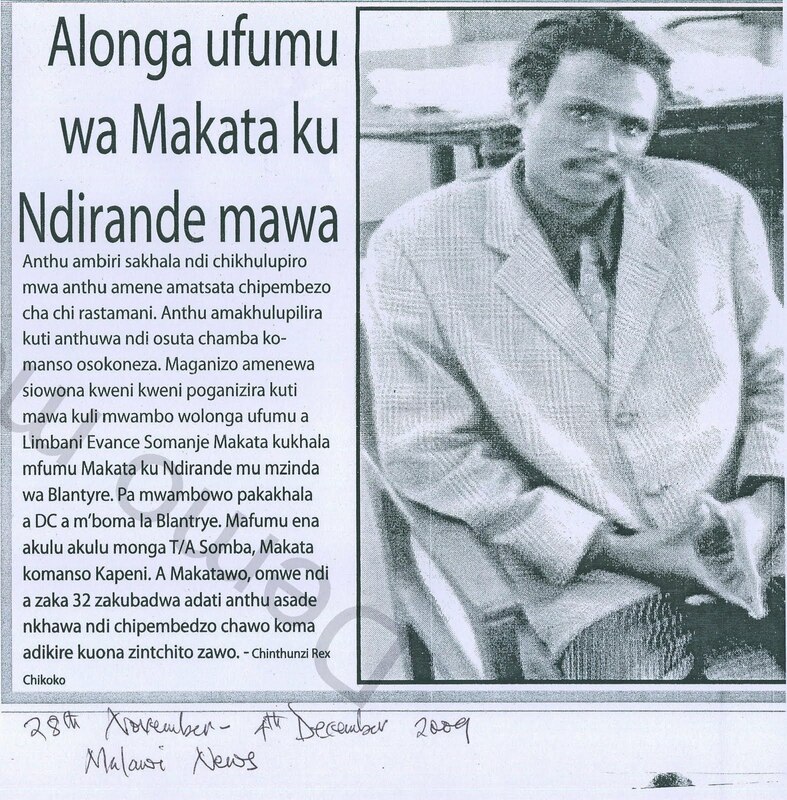 Coronation of Makata In Ndirande Tomorrow! People of the Rastafari Faith are generally despised by the society as hemp smokers and counter productive in all aspects of community life. The coronation of a Rastafarian by the name of Limbani Evance Somanje Makata as King Makata poses to disprove this entrenched misconception. His coronation takes place in Ndirande (Blantyre city) tomorrow and will be witnessed by the district commissioner of Blantyre (governor), kings from within Blantyre city like King Somba, King Makata and King Kapeni among others. The 32 year old King told the reporter that society should patiently wait for the manifestation of the works of his hands rather than prematurely judge him on the basis of his faith. Just as African people felt that the election of Mr Barak Obama as President of the United States, so too Rastafarian people will see the coronation of Limbani as an event that we can all take pride in as a sign that we are emerging from the fringes of society. Glory be to the King of Kings who makes these things possible.